Are Hispanic Immigrants Finding a Better Life in the U.S.? Compared to other immigrant groups? No. Compared to their parents? Yes. Immigration to the U.S. is, at its heart, about one thing: the search for a better life—the search for better safety, work, and education, for the immigrants themselves and for their children and their children’s children. In 2015, the Hispanic population in the U.S. reached a high of 55 million. With that, the group now represents about 17 percent of the total population, and numbers are still growing. A recent blog post from Nathan Joo and Richard Reeves of the Brookings Institution takes a look at how this demographic is faring economically. Are they finding that better life? Will their children? The data are mixed. When it comes to median income, second-generation Hispanics fall way behind second-generation Asian Americans and the general population of white Americans, making just over $50,000 on average, which is at least $15,000 less than the median earnings for both those groups. They also fall behind all other groups when it comes to educational attainment. 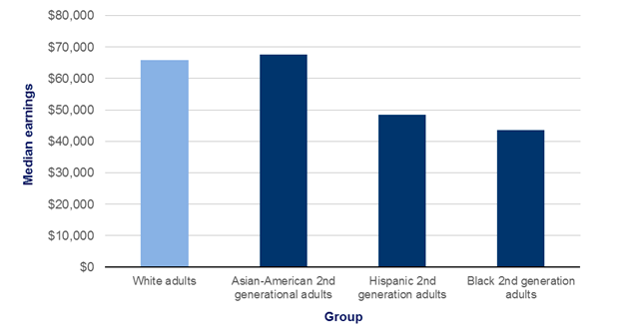 For second-generation Asian Americans, more than 50 percent of the population receives a bachelor’s degree; for second-generation black Americans it’s about 40 percent. For the overall white population it’s roughly 35 percent. But for the children of Hispanic immigrants, college-degree holders made up less than 25 percent of the population. Those results can be disheartening, especially when considering that for some immigrants—like those who come from Mexico—college-education rates are actually higher in their home countries than they are for those who have come to the U.S. But there are a few factors that brighten the picture. While the overall performance of second-generation Hispanic immigrants doesn’t seem that impressive compared to their peers, the authors say that such a comparison sells the group short. One of the most important markers of progress is the ability for a specific group to increase their educational and economic attainment from generation to generation, also known as intergenerational mobility. 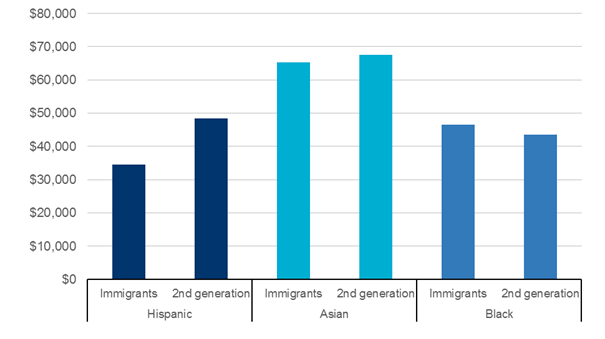 When looking at the children of Hispanic immigrants and their parents, the results are much more impressive, especially when compared to the gains of other second-generation immigrants. The reason: many Hispanic immigrants are starting out much poorer and with much less education than those are groups, so there’s a longer way to go. “The children of Hispanic immigrants have climbed further than children from other ethnic groups, compared to their starting point,” Reeves and Joo find. By the time second-generation Hispanic immigrants enter adulthood, their median earnings are more than $10,000 higher than their parents. For Asians, median income is only slightly higher and for blacks, median income appears to actually decrease a bit by the second generation. But it’s not just about earnings. The careers that second-generation Hispanic immigrants get are also generally a big improvement from those that their parents have, with a much higher share of second-generation Hispanics working white-collar jobs as opposed to their parents who are more likely to be blue-collar employees. And educational attainment just about doubles from first to second-generation immigrants within the Hispanic community, a much more significant gain than that of Asian- or black-immigrant children. Such self-comparisons are important because they factor in the characteristics of who, exactly, is arriving. For instance, a higher share of immigrants from Asia and Africa are coming to the U.S. with a college degree (compared to Hispanics), it is more likely that their children will also go to college. Comparing Hispanics with such groups isn’t particularly fair. Hispanic immigrants and their children are, for the most part, still struggling economically, but it’s worth noting that, even so, they’ve made remarkable progress already.